By the middle of August, according to present engineers’ estimates, there will be opened to traffic a new state highway in Massachusetts. As soon thereafter as is feasible, a commanding figure, the heroic statue of a lone Indian, silhouetted against the sky three thousand feet above the sea level, visible for miles from the valleys far below, will dominate a wonderland new to the experience of those who, by thousands, have re-discovered New England, and return ever and again to seek fresh manifestations of a charm that is found nowhere else in America. This statue, conceived to perpetuate in steadfast dignity the spirit of a vanished past, will not only be symbolical: it will possess a significance founded in a unique association of historic facts. For this road is no ordinary road. A new highway, it is yet the oldest highway, possibly, through this section of the country. Obscured for generations, the knowledge of its origin confined largely to students of folklore, its part in the stirring scenes and important events of early American history recorded only in local commentaries, the very reason for its obscurity is destined to become its greatest fascination. That reason is the hitherto wellnight inaccessible nature of the region through which it passes. 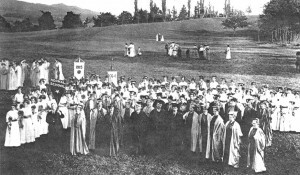 A Normal School student by the name of Anna C. Hennesy offered a beautiful description of the event in the 1915 yearbook, focusing on the inclusion of many Normal School students and faculty. Anna C. Hennesy’s yearbook entry, 1915.
building of the new Mohawk Trail, was presented in Hoosac Valley Park, North Adams, Massachusetts, on the 17th, 18th, 19th, and 20th of June, 1914. It portrayed events which have occurred along the Trail from the beginning of the seventeenth century to the present time. In the first scene, “The Spirit of the Waves,” a large number of the Normal School Juniors took part. Dressed in shades of blue, to represent the colors of water, when the spirit of Greylock paused in the center of the green, the Spirits of the Waves, led by the Spirit of the Waters appeared from the river edge and surrounded her, advancing and retiring in exact representation of waves. Finally they receded, and Greylock, rising higher and higher, until he stood on the stop of the slope at the back of the Pageant green, looked back for a moment and disappeared. 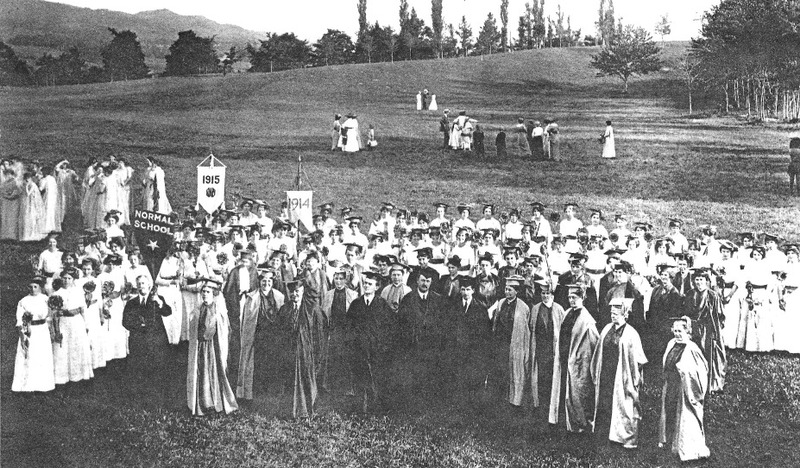 The Pageant was closed with one of the most beautiful episodes, “The Grand Finale.” In this, the Normal Faculty and members of the school represented the “Spirit of Education.” The scheme of color was a complex complementary one and very brilliant as seen against the yellow-green back-ground of the grass and trees. The Normal color, yellow, was chosen with the thought of completing the cycle of light when the school pennant should be used with the national flag. The whole pageant was a splendid success and the Normal students will always remember it as one of the happiest events of their Normal life. 1. Harry T. Pram, The Mohawk Trail. North Adams: Excelsior Printing Co., 1914.Massachusetts College of Liberal Arts Special Collections. “Pageant of the Mohawk Trail,” North Adams Transcript, 1914. Massachusetts College of Liberal Arts.